Hello everyone. Want to share another project for who like spend time with smelling flux and solder. The project is – Simple CAT Interface. I guess everyone knows what it CAT for, no isn’t CAT or DOG. Most of us have the cable CAT interface which we use to control our rig from computer. The standard cable is a simple converter from one level to another ans usually based on MAX232 IC. But how about make it cordless? Let say it in other words – make it wireless or Bluetooth device. Sounds good, doesn’t? This project is not new or something breathtaking and have been successfully done many times. So you can find a lot of information online, just Google It! What I want to share is just How You Can Do It By Yourself in simple way. Make it for yourself or ether better make it for your Dad or Mom as a present. That would be a great present ever. Just remember one thing that you will not find something like this on the market so it would be awesome gift. Let’s start. The new version of HC-05 which I have in my store on eBay compatible with Android OS and RX/TX App by YO3GGX. Guaranteed 100%. It’s very easy to connect and use. It doesn’t required knowledge other than how to connect a regular Bluetooth device. 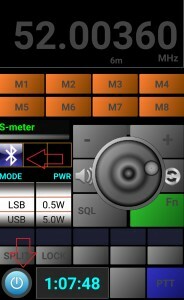 Just plug my HC-05 module into your TRX and run the application on your phone. Connect via Bluetooth. Done. High reliability, quality and strong support. It works as any other Bluetooth devices in your room. Like a cellphone. Turn On. Pair. Connect. Ready. Sounds simple! Oh yes, trust me you wouldn’t believe how it simple. What we can use it for? In same way as you use the standard CAT cable. To control your transceiver (frequency, modes and also PTT). Imagine, no cables, no web on your desk, just rig and computer. What do you need to make it? Some components, soldering iron, magnifying glass, tools, wires and patience. Where we can buy parts? Anywhere. Local radio components store (radioshack or etc), online store (digikey, mouser), eBay. The Bluetooth module sells on eBay and average price is $5. There is not a big difference between modules but I recommend use or HC-05 or HC-80. They were tested by me in my projects. Other parts are not critical. How the module looks and pin out? As you can see there is HC-80 module on the picture. For HC-05 module the LED (Paring) should be connected to PIN 32. Also I guess you noticed that I use triple color LED. It’s really up to you and TX indication just an option. Realistically you need only POWER and BLUETOOTH Connection indications. Basically you need to solder some component on top of the board. I usually solder 3.3v regulator first along with 0.22 uF 0805 size SMD capacitors and then LED on other side of the board. Be careful when you solder and avoid the overheating. The board as you noticed very small and you have to hold it when solder. 1 kOhms resistors are soldered straight to the pins TX and RX. Before solder to the connector you have to check the board and all connections. Use a small power supply. Apply 12 v to the input of voltage regulator. Power ON LED should light on and Pairing should blinking. That means everything works as should. Of course you can check the Bluetooth connection. Just follow the steps which you can find below. When everything is tested and ready to use now time put all together. I don’t know what box or case would you use but I want to show my idea. I used the simple plastic case of 10 Pin DIN plug. The 8 Pin mini DIN slides in to 10 Pin mini DIN plastic cover. Simple, easy and looks neat. Take a look. All right it looks like you made it and now time to do a final check. Make sure that your laptop or PC has Bluetooth Adapter otherwise it will NOT work. Right click on “My Computer” icon -> Click on “Manage” ->Click on “Device Manager” -> Click on “Ports(COM&LPT) -> Verify the assigned to HC-05 COM port. 9) Check if all work as should. 10) Got a problem with communication or connection feel free to contact me. Default settings for HC-05 Bluetooth Module (verify it in COM Properties). I KNOW YOU HAVE MORE PROJECTS IN YOUR HEAD, JUST DON’T FORGET TO PUBLISH MOST OF THEM ! I could not run because my phone says HC 05 device available but reports give me connect the BlueCat Blue Cat is not a device. The display of the equipment must say something special interface to be connected? I got an imported one from ebay, I managed to get it to work. was supposed to be 38400 baud, got it to work at 9600 baud. And it is slow to react to commands. Your interface seems to respond much quicker, and pairs quicker too. What about a BT interface for a FT 840? Or maybe just use a BT serial adapter on the interface cable. First of all – I can program the module for different speed (38400 for example). 9600 bps is a default value. Now regarding the FT-840 transceiver. The port speed for CAT is 4800 bps even slower than 9600 bps and as I know you can’t change it (refer to Page 35 of manual). So the Bluetooth module simply won’t work, another words you won’t be able to use one for both transceivers. Of course I can make the separate module for your FT-840 with custom settings. It would be with two connectors 1) for CAT RX/TX data and 2) for DC Power. The CAT connector doesn’t have a voltage coming out so you need to use an external source. Can you tell me more about. So you plug in the module power up transceiver and can’t find a device on computer? Does the bag in which the module came had a green sticker “QC” ? Hello, I bought one from you awhile ago also and it cannot be seen from the phone or another bluetooth device, is there something wrong with it. I bought it awhile ago and just now installed it onto a FT-817 but it does not seem to function. I do not have a green QC sticker BTW. Thanks. my ebay account is ke4pwe. thanks. Regardless green sticker there or not all units were tested before ship out. After more than 300 sold modules none was returned as non operational. In more than 30 cases people couldn’t figured how to use it and didn’t follow the instruction. First – ALWAYS turn off transceiver before you plug the device. If HC-05 gets warm or hot that means it works. Now if you plug device and can’t find it in the list of bluetooth devices please check if all pins are straight and not bend. If you don’t see a device that means there is no power going to the module. If you can’t connect device that means the settings are wrong. You have to follow step by step. 2) Plug in HC-05 module. If use use phone skip steps 4 and 5. Check those steps at your phone. If everything ok. Radio and HC-05 should work. Don’t forget that you can always send it back for free replacement. The mailman brought the BT interface today and I’m trying to set it up. Using a MS Surface Tablet running Windows 10 and the radio is a Yaesu FT-817. The BT device connects with the tablet and the comm port and radio are set at 9600 baud. The device manager shows COM4 and COM6 for BT ports. The software, N1MM+ and Fldigi don’t seem to recognize the radio. N1MM+ will “see” it for just a moment, long enough to grab the frequency and band settings of the radio and then it say “COMX is not working”. I’m sure it’s something simple that I am missing and I look forward to putting the device to use. Hello. First of all I never tested with N1MM software but it doesn’t matter. As long as it connected to PC everything should work. The speed 9600 should be set in PC, transceiver and program. Did you check both COMs? Did you check with other programs like HRD? Tried HRD (registered version) today and also with Fldigi with the same results. 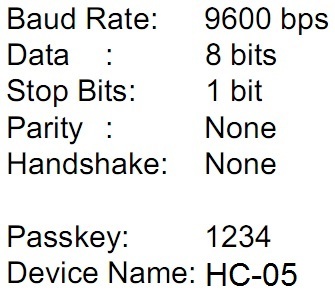 Checked the baud rate at the radio, the comm ports and the software. I have a mac laptop with BT but no windows laptop and my desktop doesn’t have BT – yet. Something odd that N1MM is doing, no matter which comm port I tell it, it says the same comm port is not working. Hello. I never tried with Win10, but it should work ether. In this case it important what drivers are installed and drivers the Win 10 picked up. It’s hard to me to determinate is there hardware or software issue. But one thing I can certainly do, send another module. Then you can compare and find where is the problem. I’ll ship it today, please check and let ne know. Then just send another one back to me. All modules passed a QC before they shipped out, that proofs the functionality of devices. So far after 300 sold module none came back as bad or not working. Always I had the same issues – wrong settings. Fair enough. Thank you you. Hello. Did you receive another one? Had a chance to test and evaluate? Thanks. Let me know how to pay you for the second dongle. I set them up with an android tablet and it all works as it should. Alright. Just send a payment of $39.99 to my paypal alex_nersesyan@yahoo.com. Let me know if you need my further help or support. Thanks. My HC-05 arrived in the afternoon mail. Plugged it into our FT-817, turned on the radio and set the baud rate to 9600. Established bluetooth connection with an Amazon Fire HD6 no problem. Opened 817 Companion app, turned it “ON” and am having NO problems! THANK YOU! You’re welcome. Thanks for your feedback! I am a little hard of hearing and have a streamer which connects my hearing aides via bluetooth to my android phone. Is there a product to use my streamer to talk on the radio? (FT-857D) Already my streamer can be set up for PC gaming. This would be very handy for me and also mobile use with out a microphone which is already built in to my streamer. No it’s not. This device only for CAT control, not for audio transmission. I could not find this item in your Ebay store. Could you please post a link? If you already have, I am sorry, just don’t see it. Thanks, as others have said, your product looks great! Currently it’s out of stock. 1-2 weeks lead time. Thanks. i`m trying to build one of these BT CAT adapters, but i`m now at the point where i dont know what to do. Everything is wired correct, BT module can communicate via COM with another Terminal, so far so good. But when i connect it to my FT-857D Ham Radio Deluxe says that it can not read the frequency and no connection is established. Any idea? 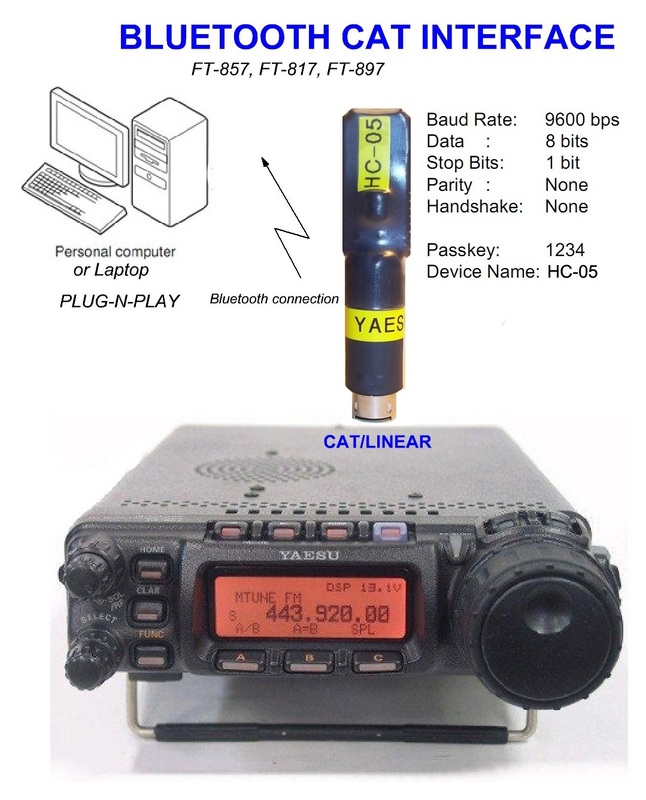 How do I order your Bluetooth CAT Interface for Yaesu FT-817ND? I cannot find a link to order. Hi. 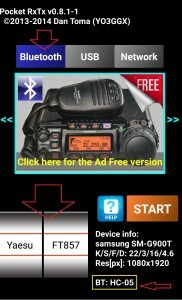 How do i configure the App for Yaesu FT857D? 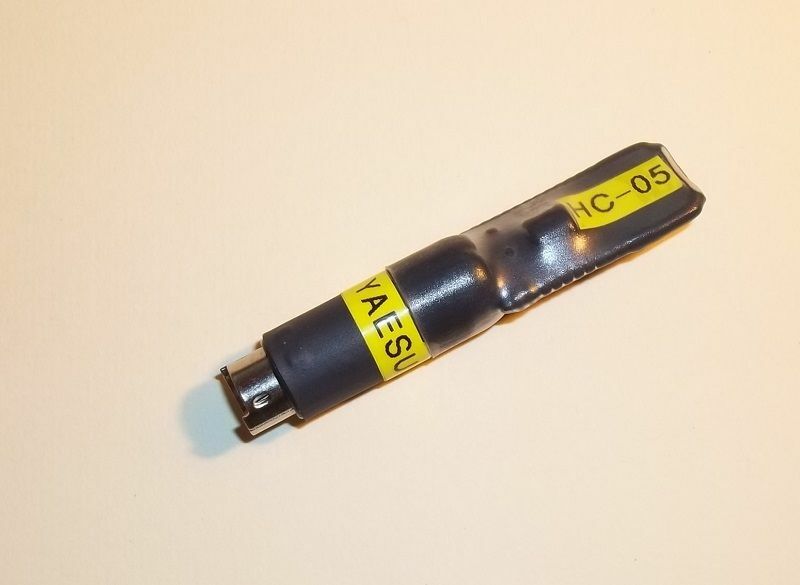 I see only Elecraft K3..
Could one of these be made for the CI-V connector on an icom? I suspect you could though you might need to provide DC power for the BT module. What would really be a nice setup is a way to not only send the CI-V commands wirelessly but also send the audio wirelessly so you could comepletely do all the digital mode work wirelessly between the radio and PC. That would be easy enough to do using a radio with an analog style audio port but my Icom 7300 sends audio out over USB (I believe it’s simply a USB soundcard in the radio itself) Which would make going wireless quite a bit more difficult. Hello Ben. Of course I can make it for Icom and you’re right it needs to be powered from any external power sources of 5-14 Vdc. More than that I have to install a level converter from TTL to RS232 and then to CI-V. I’ve done that for Icom many times as a custom order. I have to install everything inside a small plastic enclosure. Let me know if you interested and I’ll send a price. Thanks. Also you can use my email. Can you make one of these for Kenwood TM-710? Wanting to use it to for programming/CAT over Bluetooth and also possibly one at the head to access the TNC. More of a right angle flat configuration would be better at the head. Where can I get a pre-made unit? I don’t see a way to get one anywhere on this page. 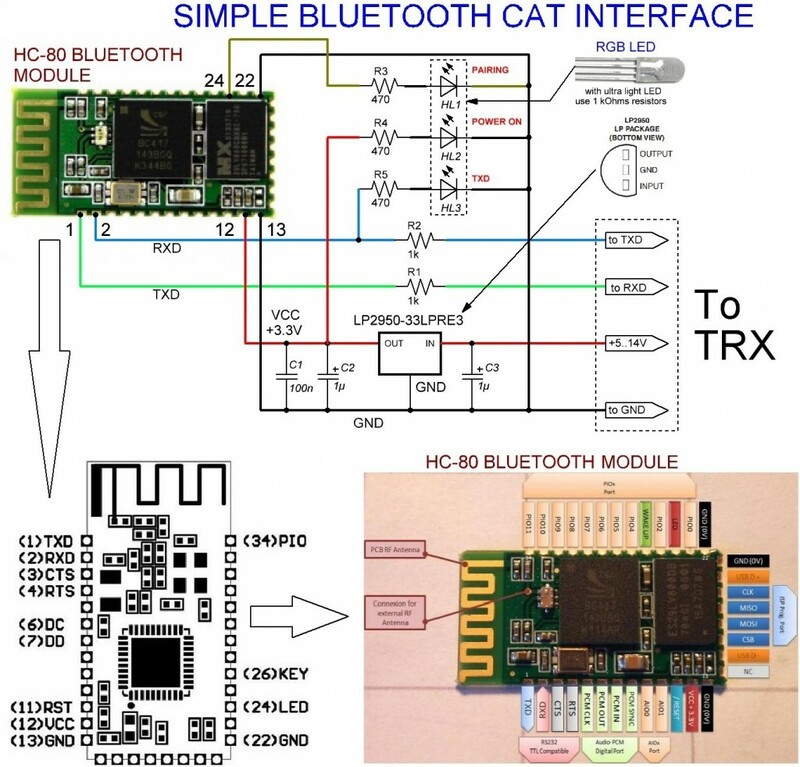 I would like to build a Bluecat-interface on my own. So I ordered a HC-05 Device and will solder it as your instruction on this site describes. My question is: will it work with RepeaterBook on Android? Has this been verified? 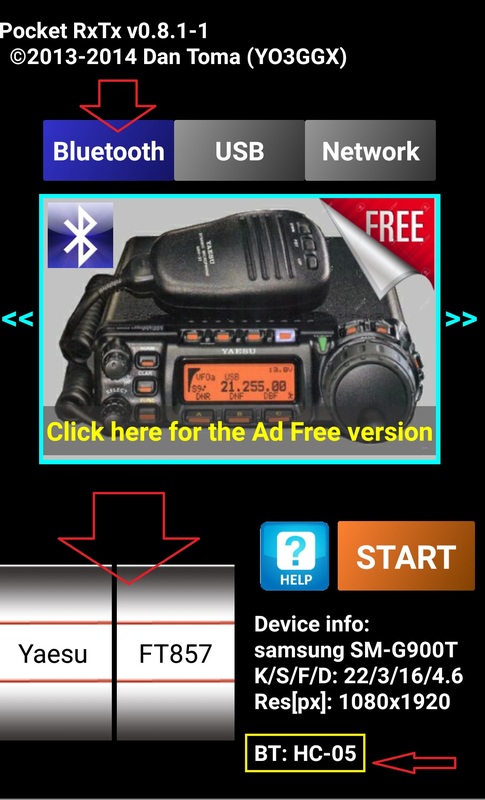 I would like to build one for an Icom IC-7000 to use RepeaterBook from Android. Anyone here knows how to make this work for the MCHF sdr radio? Alex, Nice build first off. I’m interested to know if you would be able to utilize this as a bi-directional com port for aprs. Jess KM6GVW had asked the question back in Dec 2016 and I am wondering if you had any additional communication with him. I also have a 710G and have experimenting with APRS and have successfully connected my 710 to a Windows 8 tablet with the RT Systems USB-K5G programing cable. I then am able to run APRSIS32 connected to the APRS IS and RX TX from APRS IS. Due to the tablet not being able to charge while connected to the USB connection to the radio, along with an additional wired connection I am wanting to utilize the Bluetooth function of my Tablet. My goal ultimately is to mount the tablet into my truck to allow easier messaging capability through APRS. I have had great success with this with my wired connection but I would love to loose the wire. Hi Alex, I need your opinion. I ordered my HC-05 for a Yeasu FT897D and had it set to 9600 bps but I do have a problem. It should be installed into the Cat/Linear jack (8 pin) but I use my external antenna tuner in that jack. There is an additional jack on the antenna tuner which I assumed would be fine to use but in the manual it says that it’s set for 4800 bps. According to my understanding, I think I would have to order another on and have you set it to 4800. Hi Tom. No problem. You can ship it to me and will program it to 4800 bps. Thanks. Would like to no if I can use your BT module also to program an ft857d with software like chirp…or onather programming software pakage? good post. Any more information? Is this your Bluetooth adapter? Or how do I purchase one of these already built? Direct or via eBay? I would like to use “Pocket RxTx” on my android tablet. What baud rate do you recommend for the Yeasu FT-100 (NOT Ft-100D)? Hello, Very interesting and very generous for sharing. Is the HC-80 still available? I have looked for it and am unable to find it listed anywhere.. There is to FT 450 D ? but nicer would be a second Version for MIC/Cat Connection via RJ45 for the FT-857. 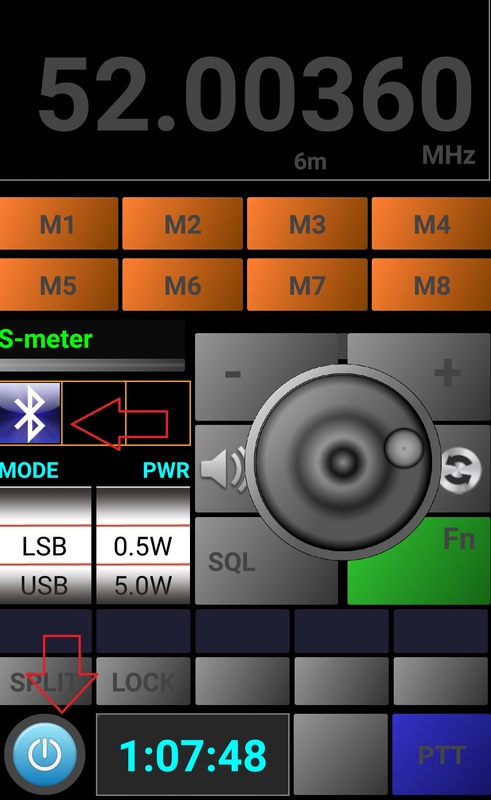 Hello, I would like to control my Icom IC-7000 radio with my Android Phone, and your “Simple Bluetooth CAT Interface, RX/TX App Android” project is very interesting for this purpose! However there is one thing I don’t understand: your schematic diagram shows 2 different wires for TXD & RXD, but Icom CI-V signal uses only 1 pin for both TX and RX (multiplex). Any chance of making something like this for the 450D? 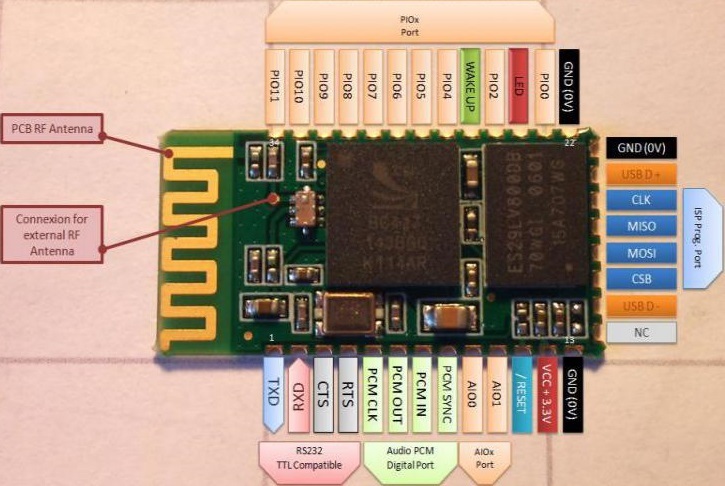 Have you made a bluetooth interface for the IC-7100? 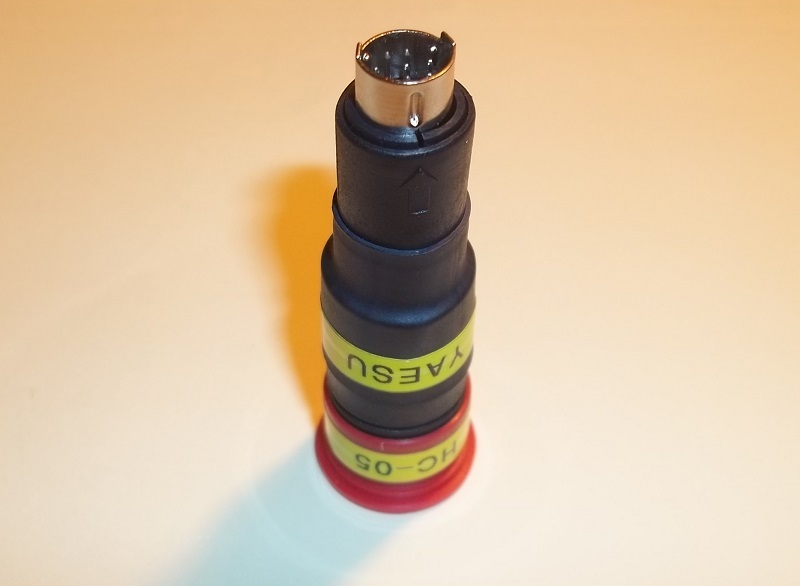 I was going to make the one you had for the yaesu but ended up selling the rig. I would love to do the same thing for my ic 7100. Hi Alex – would love to buy one. Can you share an ebay link? 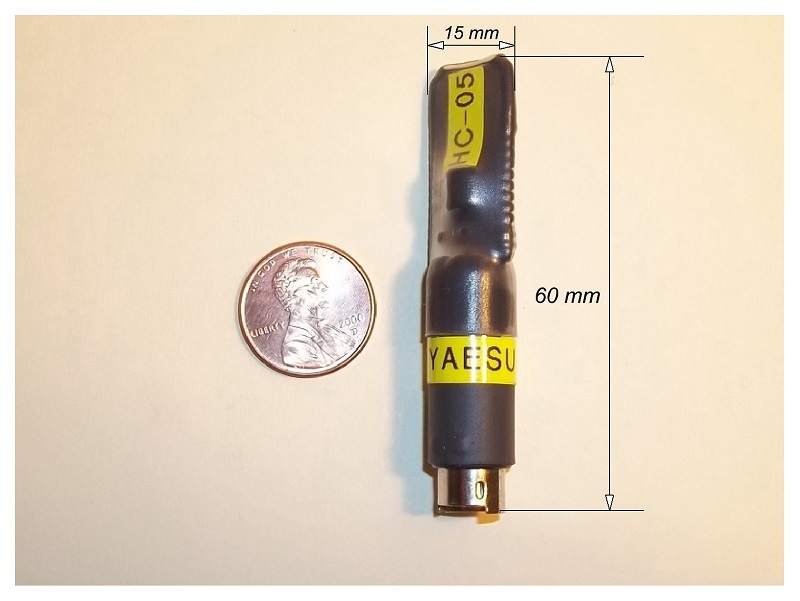 Will need 4800 baud, for use with Yaesu 857D / YT-100 tuner. Do not sell them anymore. Thanks.